I just want to kick off this post by saying that I met Keke Palmer at work on Monday and she is the SWEETEST human ever! She's on Star on Fox and has new music, so go and check it all out. I've loved her since I was little so meeting her was a dream come true. Okay, back to what this post is really about. I've been on a health journey for a while now. I have great days and I also have bad ones when it comes to working out and being healthy. I am such a foodie and I enjoy a good meal. I love indulging, but I also enjoy eating wholesome, healthy foods. Cooking is so much fun for me, so I'm always trying out new, healthy recipes. If you're looking for some healthy meal inspiration, look no further! 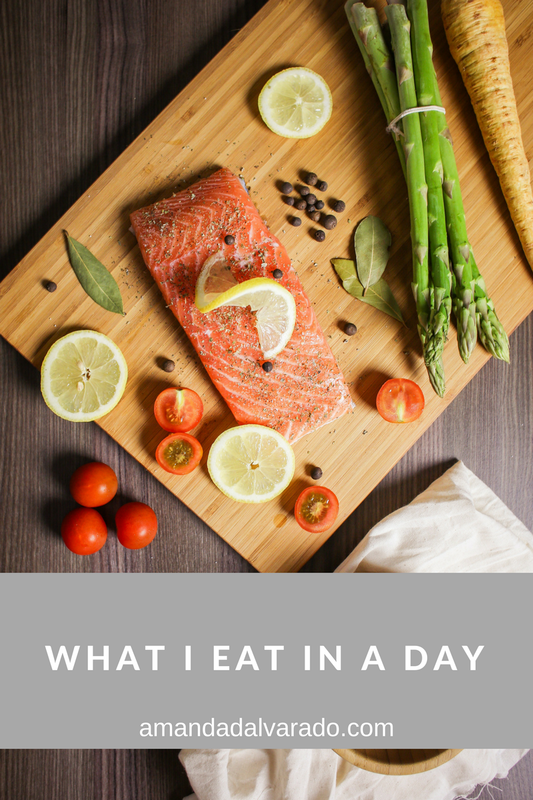 I'm sharing what I eat in a day! Every day is different as far as what I eat. Breakfast does stay almost the same, though! For breakfast, I typically have an egg and veggie scramble! I sauté bell pepper, onions, mushrooms, and tomatoes, then I add two eggs and scramble it together. I also take some Emergen-C some days for an extra boost of vitamins and minerals. My treat for the day is my cup of iced coffee with a little bit of fat free milk and organic vanilla syrup from Monin. I always bring my lunch to work! Usually, it is leftovers from dinner the night before. I recently had a chicken burrito bowl! Some rice, beans, chicken, lettuce, tomato, onion, avocados, with a little sour cream! Delicious! Bringing my lunch to work keeps me from spending more money than necessary and ensures that I am staying on track. I track what I eat using the app Lifesum! Dinner is always different, but I love salmon and try to have fish a couple times a week! I love making a lemon-butter salmon! It is really easy and I always eat it with rice and broccoli! To make it, you just place your salmon in a baking pan with lemon juice, sliced onions, butter, salt, pepper, garlic, and parsley. Bake it at 375 degrees for about 20 minutes. Easy, healthy, and delicious! If I'm hungry in the evenings, I'll stick to having some fruit or a small square of dark chocolate if I'm craving something sweet. Occasionally, I do have a small dessert. You gotta treat yourself! What are some of your favorite lunches to make for work or school? I'd love it if you shared!